Hello! I’ve just joined the Durham Priory Library Project as the Zeno Karl Schindler post-doctoral fellow for the next year. I’m excited to be working on the priory library at a time of profound and pretty disorientating change- the sixteenth-century English Reformation. Durham was caught up in a see-saw of religious turmoil, as within twenty years Henry VIII broke with Rome, Edward VI pushed for a more puritan church, Mary I returned to Catholicism, and finally Elizabeth I established her own version of a Protestant church. Each change of monarch meant new ways of worship and new expectations of the cathedrals. Durham had to change or resist. My part of the project will look at how those choices played out in the former priory’s library. 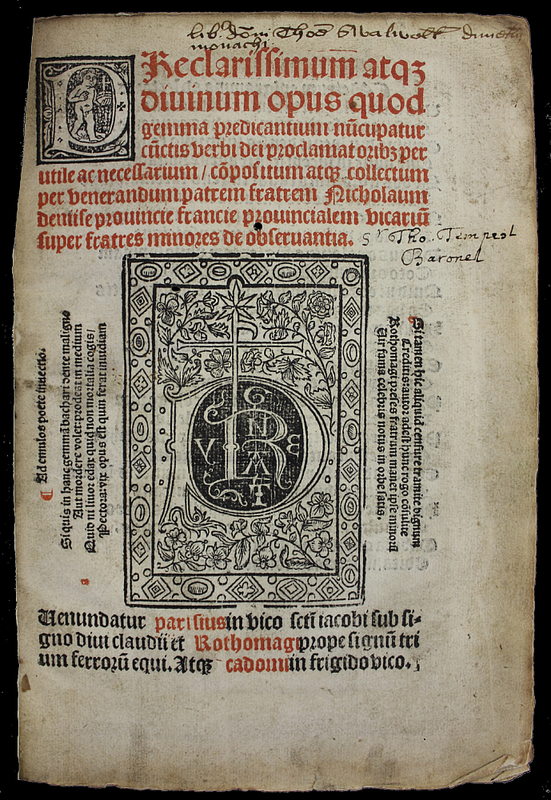 Books that were at Durham in 1539, when the priory was dissolved, have had a variety of fates. At the extremes, some seem to have been lost entirely and some stayed safely in the cathedral. If a medieval book stayed at Durham through the sixteenth century, it’s a fair bet that it’s still here. Scroll down to see examples of the material that the project is currently digitising. Still other books went walkabouts during the sixteenth century and are now known to be elsewhere, including close by at Ushaw College or far away (such as the Lindisfarne Gospels now in the British Library). A few, like this lovely printed copy of Dun Scotus annotated by Thomas Swalwell, have come back to Durham in the last century. This first month has been about getting a feel for what’s here and what the exciting possibilities are. The first priority is getting a sense of the people involved, who stayed at Durham even after it was no longer a monastery and who had access to the library. It’s a bit early to be getting a strong feel for their personalities, but I’m already charmed by the marginalia of Robert Ridley in the Cathedral’s two volume copy of St Ambrose’s works (DCL D.VII.23-24). His annotations in the margins sometimes make you think that he was having a grumpy argument with Erasmus. Other names that keep popping up and who I’m looking forward to getting to know better include the Marley brothers, Thomas Sparke, and a particularly elusive figure, Richard Crosby. One strand of my work will be to understand how books left Durham, so I’m also starting to think about the commonalities of the material that ended up in three inter-related groups. The first is the antiquarians- people like Robert Cotton and Robert Harley- who gathered up historical writings, interesting financial accounts and the like in the late sixteenth century. Neither Cotton or Harley seem to have visited Durham, so I’m thinking about what sort of connections they might have used to acquire books. The second group are the former monks such as the Marley brothers who left the cathedral in a huff in 1558 and 1570 and went to live with recusant Catholic families in the area. They seem to have taken plenty of priory books with them. I want to see if they took books that had personal meaning to them. The third group is hypothetical at the moment- was there a deliberate dispersal of books by the cathedral chapter in the 1560s and 1570s of material that they didn’t need or want anymore? Nicolas Denyse, Gemma praedicantium, with annotations by Thomas Swalwell and then owned by Sir Thomas Tempest. How did this leave and return to Durham? I’m also very excited about my other strand. The cathedral community was formed in the difficult middle years of the sixteenth century. I want to look at how the cathedral adapted to the Reformation. We know that the chapter partied in the dean’s house when in 1553 Mary I came to the throne and restored Catholicism. But equally canons had been heavily involved in the Henrician Reformation. Some of the adaptations must have had a practical side. I want to think about how the monastic church was adapted to the needs of the canons and vicars. Instead of a dormitory they needed separate houses. The monastic liturgy and music would no longer be used, so what replaced it? In 1593, the writer of The Rites of Durham was still nostalgic for the monastic life. I’m hoping to be able to see how and when the cathedral community adapted to, resisted or argued about new religious demands. The library and the surviving financial accounts are goldmines for tracking the slow and often disputed re-creation of Durham as an Anglican cathedral. I’ll be blogging about things I find in the archives here at Durham as well as material that is now elsewhere. I’ll also reflect on what this means on a wider scale- for religion in the north-east, for our understanding of sixteenth-century libraries and for national religious policy under the Tudors.